This article summarises the results of the conference with reference to the methodology, main themes and future of the archaeology of stone quarries. Discussion of methodology covers contributions on archaeological excavations, archaeometry of the stone material, and field survey to record the presence of quarries. The inherent problems of the chronology of exploitation are then touched on, followed by classification of the different aspects of ancient quarries which can be the subject of archaeological investigation. These aspects are set out under nine research headings, as follows: geology and characteristics of the rock formations; typology of the quarries and quarrying techniques; productivity, and typology of the products; internal organisation of the quarries; accessibility, infrastructure and settlement patterns of the surrounding territory; trade and distribution of the quarry products; ownership, administration and management; patrons, middlemen and officials, labour force; development and reuse of the quarries. With regard to future research the importance is stressed of regional studies with the scope to investigate, for specific territories, the role of quarrying in the local economy. In doing so, the picture of production and trade in common types of building stone can be integrated with more traditional studies of marble and its associated macroeconomics. 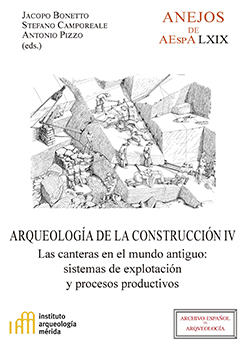 Finally, this article considers how the archaeology of construction, taking account of the relationship between quarries and construction processes, can better reconstruct the history, society and economy of stone quarrying. This book was added to our online catalog on Monday 20 October, 2014.